The National Oceanic and Atmospheric Administration (NOAA) today released a new report, The State of Deep Coral Ecosystems of the United States, prepared by NOAA’s Coral Reef Conservation Program. 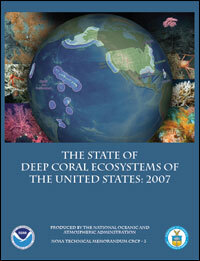 The report, written by experts in seven regions around the country, provides an up-to-date assessment of deep coral ecosystems in U.S. waters including: the biology of deep corals and their associated species, their spatial distribution, the stressors that may threaten their survival, current management measures, and regional priorities for future research. The State of Deep Coral Ecosystems of the United States report shows that these habitats, found at depths ranging from 50-3000+ meters, may be much more extensive and important to ocean ecosystems than previously known. NOAA works with Regional Fishery Management Councils, Fishery Science Centers, other Federal partners, academia, the environmental and fishing communities and other stakeholders to understand and protect these unique ecosystems.